I *really* have been concentrating on working on finishing up various UFOs that I had organized (some time ago) into a number of bins. When that organization was done, I had at least 5 bins full of UFOs and WIPs. I put my nose to the grindstone and steadily worked on either 1) finishing the UFO into a top or 2) deciding that the UFO wasn't giving me enough love to be worthy of being worked on. I'm not sure exactly when I started on this specific bin but it was MANY months ago. My efforts have been limited to simply making the UFO into a quiltable *top* ... but not necessarily *quilting* the top. That step will occur later. A lot later. ohmygosh, a Red Letter Day! 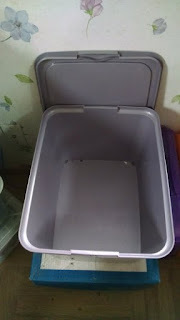 BUT ... today, I achieved an incredible accomplishment: I EMPTIED A UFO BIN. Lordy, lordy ... do I feel ecstatic!! I can't even tell you how many UFOs were in that bin, as I didn't think to count them when I started. However, there were A LOT. 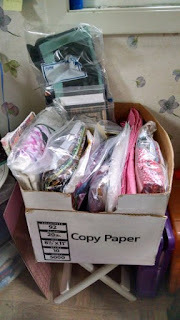 This bin was FULL of UFO packages .. all of them complete with patterns and fabric to make them. Most of the UFOs were actually pieced together into a quiltable top. As I remember, only 3 items were put into the "reject" pile, to be disposed of later on. Two of those items were soft pre-printed fabric book panels, originally destined for a toddler, now long since grown out of that age group. Fortunately, one of my forum quilting associates said that she was interested in buying them .. so voila! Those items are now disposed of! The one other "reject" had the fabrics put back into the general population and I will attempt to sell the pattern. uh oh ... 13 UFO projects in here! Not to waste time, I promptly pulled the next UFO bin from the shelf and put it in the batter's box, so to speak. I counted the UFOs and there are 13 packages in this bin. However, as I went through them, there is at least one that isn't going to be made .. it's a vest and I'm not into wearing vests any longer. I'll put that pattern in the "to sell" pile and repurpose the fabrics. I recognized some real humdingers in that bin; it's going to be an interesting assortment to work on. And as long as I was tidying up and reorganizing that area of my sewing room, I decided that it was finally time to put my collection of scraps into their appropriate scrap baskets. 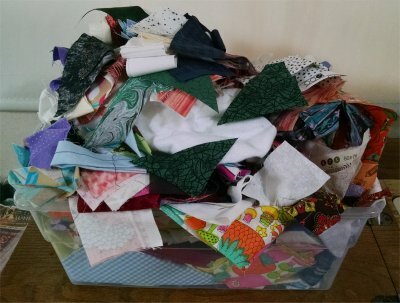 When I'm sewing, I have *one* all-purpose scrap bin that I toss all remnants, cut offs, etc into. When it reaches the over-flowing stage ... that you see here ... then I'll stop what I'm doing and sort the scraps into colored bins. And I did exactly that. So, along with a new UFO bin to work from, I also have a newly emptied scrap basket. First half star ... so pretty! I came >thisclose< to finishing MUCH earlier than I actually did with this star. 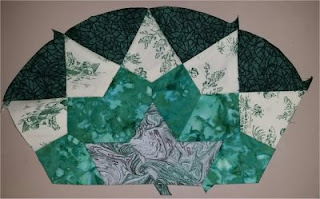 The 6 inner diamonds were to be made from a printed green marble .. a very pretty design, if I say so myself. I stitched all the appropriate pieces and sub-units. Then came the assembling of the star itself ... first one half and then the other. The first half turned out beautifully. ACK!! How did those pieces get in the center?? HOLY MOLEY. HOW THE HECK DID THAT HAPPEN?!?!?!? Remember that I said the green marble was to be in the center? Well, somewhere along the line, I simply wasn't paying attention and assembled the WRONG PIECES in the center. Geez, Louise. What an incredibly STUPID thing to have done. Not only do I have to rip out all that hand stitching but then I have to go back over the same real estate and stitch it back together .... CORRECTLY. I tell you, I was sorely vexed. ahhhh!!! A nicely completed star! But ... it obviously needed to be done, since the second half was unusable as it was. Even with sporadic interruptions during the rest of the evening, I did get Stash Busting Star #3 completed. I am currently in love with EPP. It's working with small, little units that I can pick up and finish on a moment's notice. It's a fantastic portable project that I can take anywhere. I made myself "grab-n-go" little bag that contains all the supplies necessary to work on an EPP project so I can be usefully occupied on road trips ... or waiting during appointments, etc. I've finished at least one big bed quilt top with the EPP method (hooray!) and am currently working on my next one. (hooray!) I have even mapped out a continuous thread (OH HOORAY!) quilting design for the big bed quilt top, although I haven't started quilting it yet. I whip stitch my seams, about 12-14 stitches per inch (yep, I counted them! ), so it's a pretty substantial bit of stitching to hold the pieces together. I don't use the ladder stitch *at all* because I can see, even when I gently pull the EPP pieces opposite each other, the ladder stitch does not hold well, as it "opens up" and creates gaps. My whip stitches absolutely show no gaps when the EPP pieces are similarly pulled. 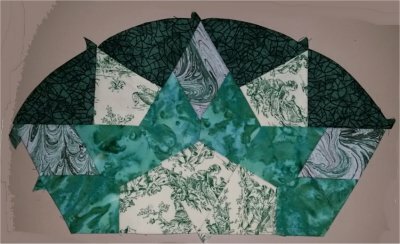 I recently took a class from a national instructor on longarm quilting designs. He got to chatting about his other interests and one of them being EPP. One aspect of quilting EPP never occurred to me and I'd really appreciate any and all of you, dear Readers, to comment on your thoughts on this aspect. The instructor mentioned, quite rightly, that when you sew all your EPP pieces together, the edges are butted right up to each other. Obviously, these seamlines are *not* nested. As such, there is *no* ditch to do a stitch-in-the-ditch quilting. Sure, you can do an echo stitch to the side of the seamline, but you can't do a SITD because there IS NO ditch! If you tried to do a SITD, you'd just be stitching between the EPP pieces and not through them at all. The best quilting design would be some sort of overall design because that doesn't require any SITD stabilization stitching. BUT ... even if you do a nice overall design, those butted seamlines are going to be stressed when the quilt is used. So, what can you do to augment this circumstance? Well, the instructor said what he does is to put a large, seamless piece of muslin *under* the EPP top and on top of the batting, rather like a false top. There would be *four* layers of fabric. The muslin would act to help stabilize all the EPP pieces by helping absorb the stress of the quilt being pulled about when used. While this may be true, it occurs to me that quilt tops are heavy enough as they are. Add in the weight of batting and backing and sometimes you end up with a quilt that you could literally smother someone with love! If you add *another* layer of fabric, the weight is only going to increase. Is this something that is considerable enough to be concerned about? Or would the extra weight of the "false top" negligible? Has anyone ever done this? Ever considered it? For those of you who have actually quilted your EPP tops, have you experienced any stress problems with the seams? .. i.e. have they pulled apart? 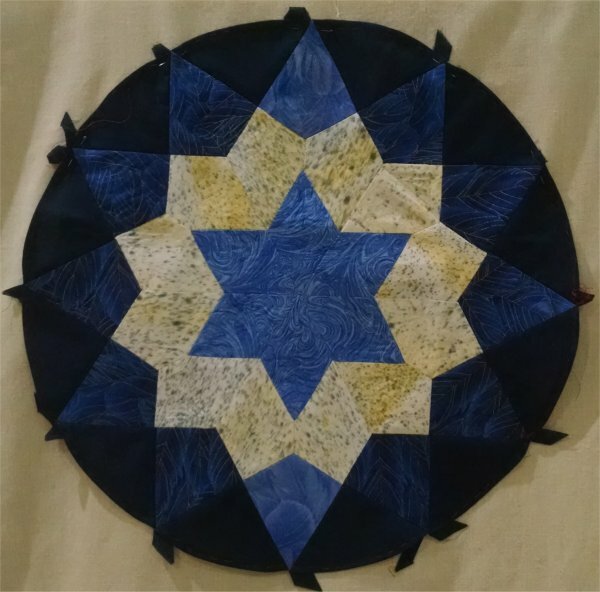 Continuing with my progress on Esther Aliu's "Stash Busting Stars" project, I have finally finished star #2. This one is made with rich, luxurious blues. For the center, I chose a printed marble. Obviously, real marbled fabric would be luscious, but printed marble is what I had in my stash. Next came a hand dyed, mottled white/yellow/gray. I had only a fat quarter of this fabric and it was just enough. I found this fabric in a now-defunct fabric store in Alta, CA on our annual family camping vacation. It's sad that quilting stores don't stay in business .... for a variety of reasons. I know there is a HUGE quilt guild in that area but I suppose that the general economy just couldn't support a new quilt store when there were already three in the general vicinity .. although a major one that was simply overwhelming in its inventory closed its doors last year when the owners wanted to retire. The third round was made from the remnants of a royal blue gradient fabric that is over-printed with gilt. Oh My Goodness .. this fabric is SOOOOOOO beautiful! I was exceedingly happy that I had enough leftover to be able to cut enough pieces for this round! 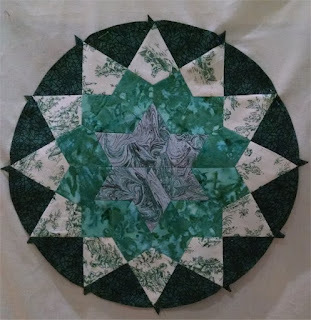 I've already picked out and cut the fabric for the Star #3 ... that will be green. I'm looking forward to working on this new color.